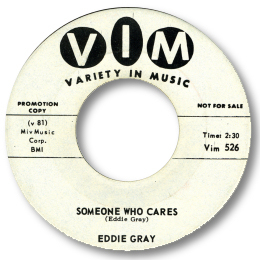 This is the only 45 I know by the obscure Eddie Gray – but it really is worthy of attention. A lovely blue tinged downward chord structure and mournful horns lead Eddie on to his sad tale of woe. Great guitar work in the background and some fine harmonies too. The overall mood and feel of the number is just the sort of little label deep soul that grabs your heart. He’s right as well – there must be Someone Who Cares. Cut in the mid 60s by the sound of it - but no clue as to location.